Art. As I left the big top, I said to myself that this show was probably one of the best creations yet from Cirque Plume. Quite apt when one considers that this one was entitled ‘The artist’s studio’, but especially so when, after having seen five of their nine productions, one is left in awe of their ability to produce true masterpieces. Less acrobatic than ‘Mélanges’ with the acrobatic cyclist Jacques Schneider, less surprising than the zany ‘Plic Ploc’ four years ago. But remaining true to the spirit of a troop that believes contemporary circus should always be a thing of wonder. 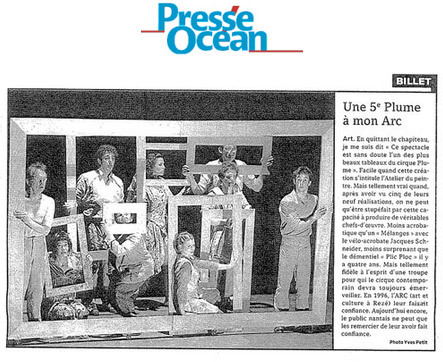 In 1996, the ARC (Arts and Entertainment Rezé) gave them a chance. Now the people of Nantes once again have reason to be grateful to ARC for having faith in them.